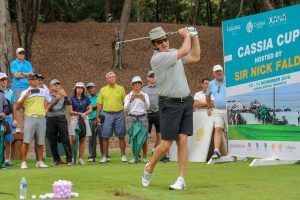 Laguna Bintan integrated resort presented a once-in-a-lifetime weekend getaway with its inaugural Cassia Cup hosted by Sir Nick Faldo – Laguna Golf brand ambassador and six-time Major winner last weekend on 10 – 11 November 2018. Adding hype to Laguna Bintan’s vibrant lifestyle programming, the successful tournament saw 115 guests inclusive of 90 golfers who competed over 18 holes with separate ladies and men’s divisions. Golfers teed off at Cassia Bintan’s latest tournament and engaged in close competition amidst the lush greenery in Laguna Golf Bintan overseeing the South China Sea. They attended the Cassia Cup Awards Dinner at XANA Beach Club, a chic party spot just a stone’s throw away from the hotel, where they enjoyed international culinary delights. Mr Antonuis Payumo with 41 stableford points emerged as the 2018 Cassia Cup Champion. He received the tournament trophy and a luxurious golf holiday package at Banyan Tree Phuket. Sir Nick also led two Golf Clinics and a three-hole playing lesson where he shared insightful golfing tips that inspired the crowd. 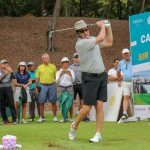 “The Cassia Cup at Laguna Golf Bintan was a great event where I was able to interact with the golfers and fans. I love coming back to Laguna Bintan under the Banyan Tree Group. It is a beautiful destination integrated resort with a lovely beach and fine cuisine, a scenic golf course and an amazing spa for a total getaway,” enthused Sir Nick Faldo. Cassia Cup is part of Laguna Bintan’s exciting lifestyle experience with Cassia Bintan – the newest property, poised as the ideal relaxing “home away from home” for travellers of all ages and interests seeking a relaxing getaway to beachside leisure. The property offers access to a 1.5-kilometre private beach, a variety of restaurants, golf and award-winning Banyan Tree and Angsana Spas. The myriad of activities includes Jetski Safari, ATV Discovery Tour, Mangrove Discovery Tour, and Gunung Bintan Adventure Trek, catering to couples and families alike. With the option for ownership at Cassia Bintan, which comes with a Laguna Golf Bintan family term membership and Banyan Tree Sanctuary Club lifestyle privileges, the guests had the opportunity to experience different activities and facilities to discover Laguna Bintan’s unrivalled tropical lifestyle at its exclusive beachfront address comprising Cassia Bintan, Angsana Bintan and Banyan Tree Bintan.